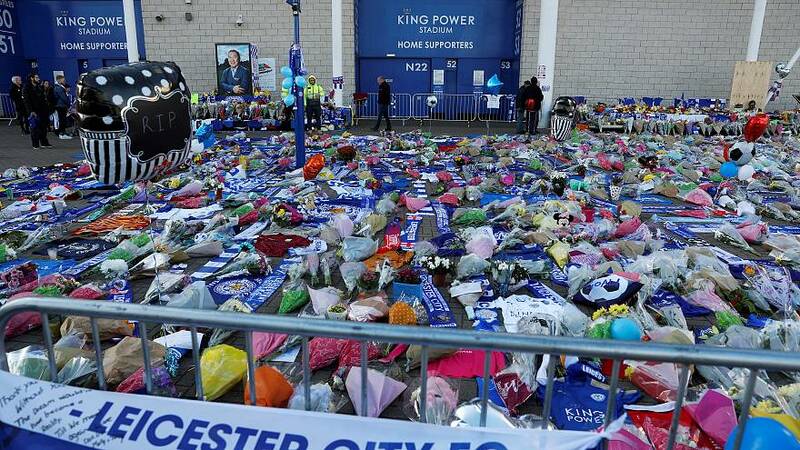 The owner of Leicester City was among five people killed when his helicopter crashed outside the football club's stadium on Saturday evening, Leicestershire Police have confirmed. Thai billionaire Vichai Srivaddhanaprabha died when his private jet spiraled out of control and plummeted into the empty carpark, after taking off from inside the King Power stadium. The crash took place at approximately 20.30 BST, following a 1-1 draw between Leicester City and Premier League rivals West Ham. According to witnesses, the Augusta AW169 struggled to clear the 25m-high stadium wall, before exploding into a ball of flames. Investigators are still working at the cordoned-off site, in the south of the Midlands city of Leicester, to determine the cause of the crash. The four other victims are believed to be two of Mr Srivaddhanaprabha's staff, Nursara Suknamai and Kaveporn Punpare, pilot Eric Swaffer, and his partner Izabela Roza Lechowicz. Ms Lechowicz, who moved to the UK from Poland in 1997, was also a professional pilot, and the couple lived together in Surrey. An official statement from Leciester City FC described the 60-year-old owner, who purchased the club in 2010 and later led it to Premier League victory, as a "great man". The statement said: "The primary thoughts of everyone at the club are with the Srivaddhanaprabha family and the families of all those on-board at this time of unspeakable loss. "The world has lost a great man. A man of kindness, of generosity and a man whose life was defined by the love he devoted to his family and those he so successfully led. "Leicester City was a family under his leadership. It is as a family that we will grieve his passing and maintain the pursuit of a vision for the club that is now his legacy." The self-made businessman, who founded duty-free retail giant King Power International, became hugely popular with Leicester fans after turning the club’s fortunes around. When Srivaddhanaprabha bought Leicester City for €44m (£39m), it was struggling in the Championship - the second tier of the English Football League (EFL). The team, known locally as The Foxes, won promotion to the top tier Premier League in 2014. In the 2015-16 season, they beat odds of 5,000-1 to finish first in the Premier League. Mr Srivaddhanaprabha, a father of four, was also respected for his charity work, which included donating €2.25m (£2m) to Leicester Children’s Hospital. Leicester City striker Jamie Vardy posted an image on Instagram of himself with Srivaddhanaprabha, with the caption: "Struggling to find the right words, but to me you are a legend, an incredible man who had the biggest heart, the soul of Leicester City Football Club." Vardy, who was one of the heroes of Leicester's 2016 victory, added: "Thank you for everything you did for me, my family and our club. I will truly miss you. May you rest in peace #theboss." Members of the public have left flowers, flags and football scarves outside the grounds, along with an image of Ganesh - a god traditionally depicted in temples in Thailand. A book of condolence, which will be shared with the Srivaddhanaprabha family, will be opened at the stadium from 8am tomorrow for supporters to pay their respects. Players in Premier League matches on Sunday wore black armbands as a mark of respect, and a minute of silence was held at a number of matches. Leicester's first team fixture against Southampton tomorrow, and a development squad fixture against Feyenoord, have both been postponed until further notice.